Perhaps if we take a closer look at the Pentagon we can start to guess what is going on here. The Pentagon has quite intriguing dimensions. The Pentagon conforms in almost every respect to the sort of Megalithic measurements we find incorporated into the giant henges of Great Britain, which were built 5,500 years ago. Each side of the Pentagon is 366 Megalithic Yards around the arc and the radius of the circle in which it is built is 233 Megalithic Rods. ( A Megalithic Rod is 2.5 Megalithic Yards. It is a unit rediscovered by Prof. Alexander Thom and it was used in the construction of the some of the bigger sites planned and laid out in the British Stone Age). This number, 233 Megalithic Rods, is extremely significant because it is a number that came up time and again in our research. 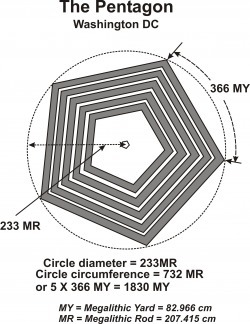 Our ancient ancestors clearly knew that any circle with a radius of 233 Megalithic Yards or Megalithic Rods would have a circumference of 1464 Megalithic Yards or Megalithic Rods, and of course 1464 is 4 X 366. In other words any circle with a radius or a diameter of 233 units is 'magical' because it also has an even number of the same units around its circumference. You don't necessarily need to understand this, though it's actually simple enough. All you really have to know is that this structure, completed in the 1940's, is a Megalithic structure and has more in common with Stonehenge or Thornborough Henges than it does with any modern building. And if the 1940's isn't recent enough for you there is an even more recent use of Megalithic Measures in Washington DC. On April 29th 2004 a brand new memorial to all those Americans who fought in WWII was opened in the city. It is known as the National WWII Memorial and it is located between Constitution and Independence Avenue. The distance between the centre of the Ellipse that forms the WWII Memorial and the centre of Ellipse Park is 2 X 366 Megalithic Yards, whilst the distance from the centre of the WWII Memorial and the centre of the Pentagon is 8 X 366 Megalithic Yards. It is clearly not possible for such things to happen by chance. Anyone who was being truly impartial would have to admit that there is something quite obvious going on here, but of course nobody would notice unless they first understood the Megalithic Yard and Megalithic Geometry. Below you can see all the Megalithic lines that emanate from Ellipse Park and the Capitol. The Pentagon is not shown on this map and is located beyond the bottom left of the map.